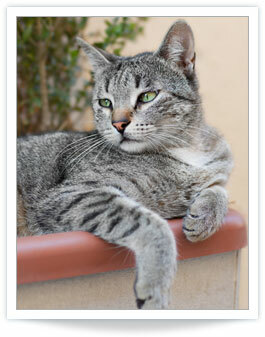 Thyro-Cat Centers treat feline hyperthyroidism with RadioIodine therapy. Thyro-Cat hyperthyroid treatment facilities are built exclusively for I-131 treatment of feline hyperthyroidism. They are fully licensed by the State Departments of Health and the Nuclear Regulatory Commission. Our centers are spacious, comfortable, climate-controlled and complete with videos for the cats to enjoy. Thyro-Cat referral cases are all reviewed by our cat thyroid veterinary specialty team consisting of board-certified radiation oncologist, internists, cardiologist, radiologists and a radiation safety officer. These team members collectively assure that each cat's needs are met prior to, during, and after I-131 therapy for cat hyperthyroidism. Thyro-Cat feline hyperthyroidism treatment centers are conveniently located in Danbury/Brookfield, CT; Holbrook/Long Island, NY; Syracuse/Fayetteville, NY; Stamford, CT; and Queensbury, NY. Wondering if your cat should be referred to us? Check out these common symptoms of feline hyperthyroidism.